This is your get-away bach. You can get away from the bustle of your life, your stressful jobs and the noise. It's pretty darn quiet here. And at night the sky is dark so the stars shine. You can also get to experience the extra warmth and sunshine Foxton Beach has to offer. In winter you can snuggle under the colourful quilts, snooze in the comfy beds, and relish the heat from oil fin heaters in every room. In summer you can sit out on the verandah (in the shade, and out of the prevailing wind) to watch the world go by. Walk to the beach in five minutes or drive in one. It's a fabulous wide beach at low tide for short and long walks; awesome for swimming and boogie boarding when the surf patrol is out; and sliding down sand dunes when the water isn't warm enough for you. A full kitchen so you can cook for yourself if you want, a bread-maker to bake that fresh loaf for the morning, or just walk 50 metres to the Ocean Beach Eatery for whatever you fancy. A garage full of toys for the adults and kids (kayak, bikes (two adult, two children - 5/6 years and 3/4 years) and boogie boards, games), and reading books, magazines for young and old to while-away the hours. For infants there is a portacot (and sheets/blankets), and a buggy in the garage (think of that spare car-boot space). Sit out on the verandah to take in the views of the park and swings across the road. Go tadpoling or duck feeding; BMXing or cycle-skills riding; forest or beach walking; tennis, skate-boarding or scooting: All less than five minutes walk away. There is no TV or wifi at Rose Cottage to get in the way. There is good cellular coverage in Foxton Beach (from your mobile phone provider) if you're desperate for an internet fix. Whether winter or summer, this is a great bach to get-away. Back section is fully fenced. Smoking outside only please. No pets thank you. Well set up for couples and families alike. Just to be clear, there is no TV. No long term rentals, prices as indicated. It has a very comfortable layout for two adults and two-three children; or four adults. It is not suitable for five adults. Extras: Cleaning (Required, NZ$45.00 per stay); All linen and towels included. Two families joined together to buy this slice of seaside life. It's a chance for us to escape the hustle of Wellington, get some warmth and sunshine, and let our kids free-will roam like we used to do as children ourselves. Overlooking the park was the big selling point. It allows us to sit on the deck and watch the kids play on the swings or run around (until they run a long way, or hide). Being close to the beach was important. The beach itself can sometimes be breezy, so being a few hundred metres back, and our unique location, means we miss most wind that might be blowing. We love the long beach walks - you can walk for up to 10 kilometres in one direction. Short walk to beach, splash on the boogie boards, kayak the waves, ride the bikes or BBQ in the sun. Bath, shower, sink and toilet. 400 metre walk to Foxton Beach. Great swimming, boogie boarding and walking. Oil fin heaters in every room. All the usual appliances, cookware, and plates/cutlery etc. Small amounts of condiments available. Sit on top kayak, lifejacket and paddle. With a set of detachable wheels to allow it be easily rolled to beach. Two adult, two childrens (ages 2-4; 5-6 years). Nice clean cottage in a great location. One comment would recommend a high viz strip on floor to highlight small step. Great location and outlook. We found the verandah a great asset. the cottage is close to the beach, park and local amenities. 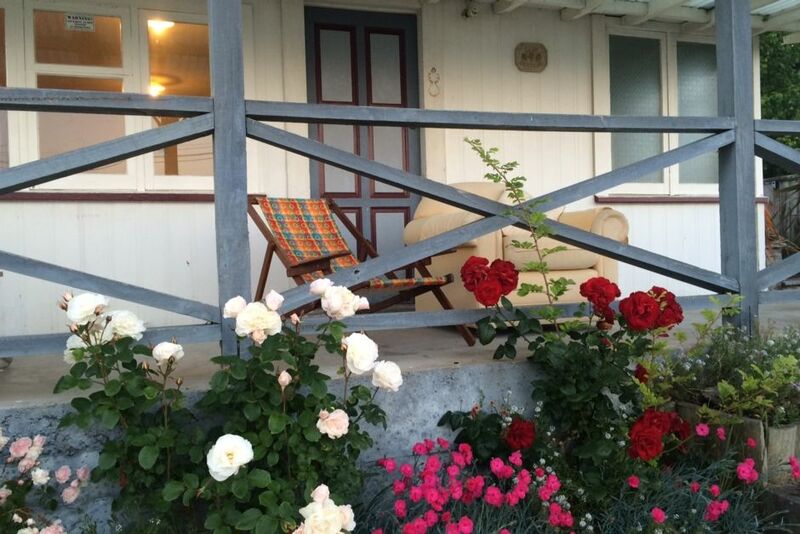 the cottage is close to the beach, park and local amenities. It has everything we needed and was very easy to live in for the two weeks we were there. Would definitey recommend to other families wanting a relaxing getaway.